Web Terminal MT4: the new level of internet-trading! The advanced web terminal MetaTrader4 is on our web-site and available for all clients FreshForex. You do not need to learn the interface of web-platform as it is similar to the version installed on your computer. All transactions occur online. You will be able to trade and carry out analysis of financial markets right in the Web version of the platform. Do not spend your time installing programs — spend it making profit! 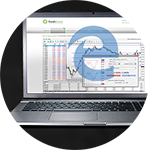 You can find the details of the web version of MetaTrader 4 on the special page. How to raise your investments up to 25%? Fund your account with the help of Perfect Money!